Preheat oven to 160°C. Heat the butter and brown sugar in a small saucepan over low heat, stirring until the butter had melted. Increase the heat to high, bring to the boil and cook for a further 1 minute. Pour into a lightly greased 22cm round cake tin. 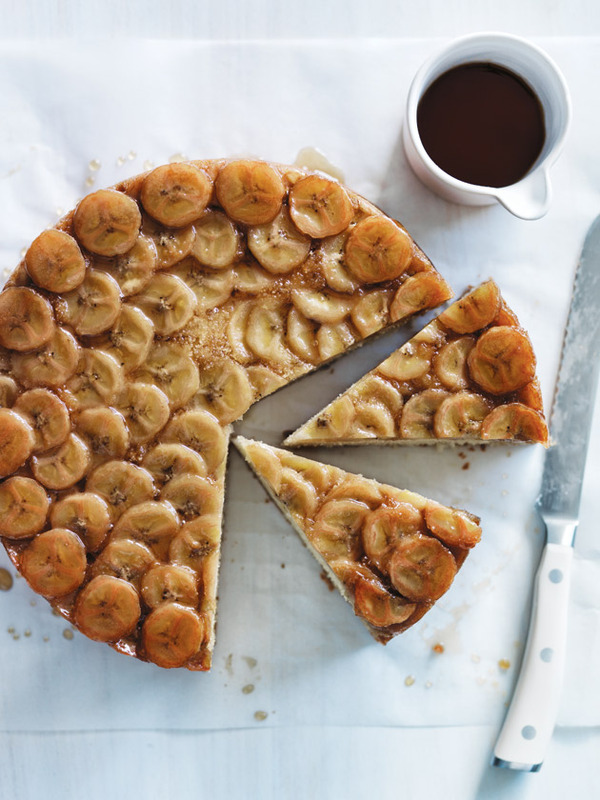 Arrange the banana slices, overlapping slightly, onto the caramel. Set aside. Place the eggs, caster sugar and vanilla in an electric mixer and beat for 8–10 minutes or until the mixture has tripled in volume. Sift the almond meal, baking powder and flour over the egg mixture and fold to combine. Fold through the extra butter. Pour into the tin and bake for 1 hour or until cooked when tested with a skewer. Allow to stand for 5 minutes before turning onto a platter to serve. Serves 8–10. Hi Donna, Made this recipe today and my caramel for the banana was not runny at all, very thick. Once it went in oven it and came out it looked fine. But did I not have the butter and sugar on stove for long enough or for too long? Either way can’t wait to try it! Hi Donna, the only reason I opened an account for this website, is to tell you how appreciative I am for it’s simplicity. No ads in the way or pop-ups. The recipe and the method are so easy to go back and forth to look at. Also, the directions you gave are right to the point and clear to understand. I followed your steps exactly, and now I’m waiting for it to finish baking. If this doesn’t come out as perfect as yours, it’s because I am not as good as you! I’m taking this dish to a potluck. I’ll tell you how people like it. (Yes, I’m the type of person who makes something for the first time and serves without tasting it…) pray for me! !